Haley Libs (4) and Ashton Terrill (6) fight to save a ball during the game against Oakland. 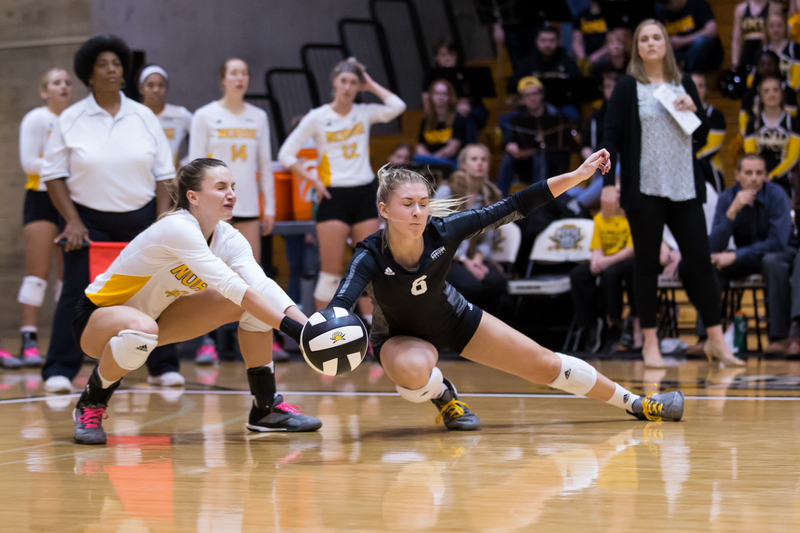 The NKU women’s volleyball team fell to the Green Bay Phoenix in three sets (25-22, 27-25, 25-19) at the 2018 Horizon League Volleyball Championship on Sunday afternoon. With the loss, the Norse drop to 21-9 overall and the Phoenix move to 20-10 on the season. This will be the first time since 2003 that the Phoenix will make an appearance in the NCAA Tournament. The Norse were led by All-Tournament Team honorees Haley Libs and Natalie Hardig. Libs recorded eight kills and seven digs, while Hardig put up nine kills and hit for .316. Libero Ashton Terrill led the Norse in digs with 19. The first set of the match started strong for the Norse. With two serving runs from Terrill and Bailey Western, the Norse held an early advantage over the Phoenix, 11-6. The host team would fight back though and managed to knot the score at 17. Back-to-back kills from the 2018 Player of the Year Taylor Wolf, resulted in the Phoenix taking the lead at 21-18. The Phoenix would continue to hold a three- point advantage until Ashley Sledge finished the Norse off with a kill. Hardig led the Norse offensively in the first set with six kills, while Terril led the defense with five digs. The Phoenix had control most of the second set, until the Norse rallied from behind with kills from Miranda Wucherer and Laura Crawford to put the Norse on a 7-3 run. The Norse were up at set point, but Wolf would spoil the comeback after a trio of kills to end the set. Crawford led the offense with five kills while Wucherer and Bailey Western added four each. Headed into the third set and with a berth into the NCAA Tournament on the line, the Phoenix dominated the Norse and held them to a .067 hitting percentage to finish the match, 25-19. To add insult to injury, miscues plague the Norse throughout the set as they posted nine unforced errors. Though the Norse did not make it into the NCAA Tournament, there is still a chance that their season will continue as they await the selection for the National Invitational Volleyball Championship. This championship will consist of 32-40 teams that did not make it into the NCAA Championship and will be announced on November 25.